HARLEX Haulage Services Ltd is a family run business that has been operating for 17 years. The operating centre is at Park Pale Farm near Cobham in Kent. 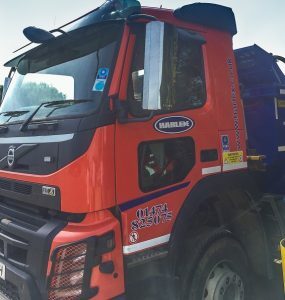 The company runs a fleet of twenty-three 32 tonne tippers and grabs delivering services including site clearance, bulk excavation, aggregate and soil delivery for its valued customers. The office is run by a dedicated team of professional personnel who support the transport team. We were first introduced to FORS in 2011 when we entered into the contract for Crossrail for Bond Street Station in London’s West End. Harlex supplied on a 24hr 7 day a week basis lorry’s and road sweepers for both ticket hall excavations. FORS introduced a new way of looking at the business with the initial Bronze focus on compliance. The progression to silver focused our attention on many items to assist the safe and efficient running of our fleet. FORS together with our ISO accreditation, fuel management system, all round vehicle cameras including an in-cab camera, fleet replacement policy and clear management makes Harlex one of the top tier operators in its field. We were delighted when we achieved the Gold accreditation and strive to maintain the standard. Here at Harlex we have invested in the future with a complete makeover of the operating centre with a new office building designed like a traditional Kent barn. The new workshop was developed with a multi-bay facility and new equipment allowing us to meet and exceed MOT standards, while facilitating our proactive preventative maintenance program. The operating yard has now been redesigned to reduce the impact on the landscape and environment. The yard has been block paved to reduce noise and to facilitate the new drainage collection system for rain water. We have designed and built a new wash area that uses the collected rain water. The run off from the wash area is recycled by collecting it in a settlement tank to be used again. We have used the resources provided by FORS to develop our staff. This has provided additional efficiencies with the team being involved in the health of the business. The tool box talks available have provided excellent guidance to the drivers with a greater understanding of their roles and responsibilities. We found the FORS standard confirmed a way of working that promoted safety and efficiency. We could see the benefits of monitoring our business and developing our drivers. We have been FORS members for several years and have used this time to develop our understanding of our business using the FORS progression route and have achieved the Gold accreditation. We are using the standard to improve the working environment in combatting unnecessary noise and the reduction in emissions. The company have continued to monitor fuel and improve fuel efficiency although the number of travelled kilometres and fuel usage has increased. We have reduced our overall fuel consumption by 1% on our baseline data. We are continuing our focus on reducing vehicle incidents although we have experienced a slight increase against our base line data. We see driver health as an integral part of our drive towards peak performance and the ongoing monitoring of drivers has helped to identify conditions that can be addressed at the earliest opportunity. This supports the drivers in being pro-active towards their own health. We provide fresh fruit to all staff during the harvest season to support and encourage change. We are a family run business with everyone working together. We have a clear strategy for recruitment of new drivers. This includes a referral scheme, advertising on a recruitment website and our own. We advertise at the operating centre to reach out to drivers visiting the centre and passers-by. We are a team and the team share the benefits of safe and efficient productivity monthly. Family events are organised to encourage and support the team. We are researching ways to encourage new drivers in to our industry with connections with local development company’s and colleges. We have carried out many noise assessments around the vehicle and driver activities. We have been able to reduce the noise level of the PTO when using vehicle mounted grabs. The vehicle parking area and yard has been developed with block paving to provide a quieter work area. Noise reduction is one of the environmental aspects that we are currently putting our attention to. The working environment in the construction industry has its challenges, but we are determined to be pro-active in the reduction of noise were ever possible. We have now added noise reduction into our requirements for fleet replacement. This is also part of our research into modal shift and alternative fuels so that we have a clear strategy for the future. We started our journey 2011. We soon realised how the FORS standard would benefit the company. As a business we want to demonstrate our quality of operations and compliance. We saw the progression to gold as the way to do this. We have evolved as a business in our progression. Investing in our staff, facility, and systems, which allows us to manage the business as a professional and compliant operator. This has lead the company to adding further accreditation such as International Organisation for Standards (ISO) and joining the Construction Logistics Community Safety (CLOCS). Achieving and maintaining Gold accreditation, we feel, underlines our commitment to the scheme as well as providing a gold service to our valued client base.